I'm going to call this a simple scoop because I only took three bites. 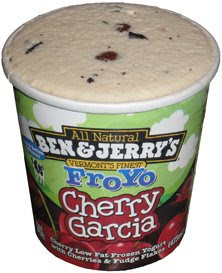 I knew what to expect and I just wanted to verify my expectations: the cherries are very strong, stronger than regular Cherry Garcia, but also strong enough to make you forget you are eating frozen yogurt. I think that's the key to getting people to eat frozen yogurt = distract them! We have a quality product here and my wife is adoring every bite of it. A pint of frozen yogurt might actually become a staple in our fridge now.